Often as we think about the sacrifice of Jesus, we tend to focus on the unbearable physical pain He endured. We’re told that He was hit, flogged nearly to the point of death, and had a crown of thorns driven into His scalp. He was made to carry His own cross. Nails were punched through His hands and feet before He was hoisted into the air to suffocate in one of the most inhumane and cruel forms of capital punishment ever devised. My friends, it’s hard to not focus on the pain He endured for us. But, as we look at this Easter, I want you to consider another way Jesus was made to suffer in the moments before His crucifixion. Consider the emotional pain Christ endured as those who were closest to Him turned their backs. Jesus loved them, and yet He knew – long before they did, in fact – that a couple of these men would publicly betray Him. Judas, of course, is the one that comes instantly to mind. After all, it was his betrayal of Jesus that ultimately led to the crucifixion. We’re told in Luke 22 that “Satan entered into Judas…” (ESV). John 13:2 says “the devil had already put it into the heart of Judas Iscariot, Simon’s son, to betray him” (ESV). Judas went to the chief priests and officers, accepted a payment from them and then actively plotted how to betray Jesus into their hands when there wouldn’t be a crowd around Him. Judas’ treachery was the ultimate betrayal, directly resulting in a sham trial and the agony of the cross. But I wonder if the second betrayal might not have hurt just as much as the first. Along with James and John, Peter was one of Jesus’ closest friends whom He chose to be a witness to key moments in Jesus’ earthly ministry. For instance, Peter was there for Jesus’ transfiguration on the mountain and at Gethsemane on the eve of Christ’s sacrifice. Peter’s denial of Jesus – which, according to Mark, Jesus foretold prior to leaving for Gethsemane – must have stung deeply. As Jesus was being beaten and ridiculed (Mark 14:65), Peter was busy distancing himself from Christ (Mark 14:66-72). Three times people approached Peter to ask him if he was associated with Jesus, and three times Peter denied Him, even going so far as to “…invoke a curse on himself and to swear, ‘I do not know this man of whom you speak.’” (Mark 14:71, ESV). At a time when Jesus was being accused and beaten, His friends turned their backs on Him. What emotional pain this must have caused, even as Jesus knew it was coming and understood that it had to be! Maybe you’re reading this, and it sounds a little too familiar. Maybe you have friends or family members who have turned their backs on you, or perhaps – like Judas – they were instrumental in causing the suffering you are now enduring. Maybe you’re struggling through pain and despair, and the people you thought you could depend on have disappeared. Maybe you’ve been hurt by others in the church. Bodily pain hurts physically, but emotional pain slices directly to your soul. My friends, I’m here to tell you that people will let you down. People will turn their backs on you and cause you pain. But here’s the key – Jesus was forsaken, betrayed and crucified, but He conquered all of that! People are imperfect, but Christ is risen and will not let you down! The Bible tells us not to put our faith into men or princes. Instead, this Easter place your eternity in the One Who endured scorn, pain, and – yes – betrayal from His friends, so that you may have a hope that extends far beyond the pitfalls and pains of this world. 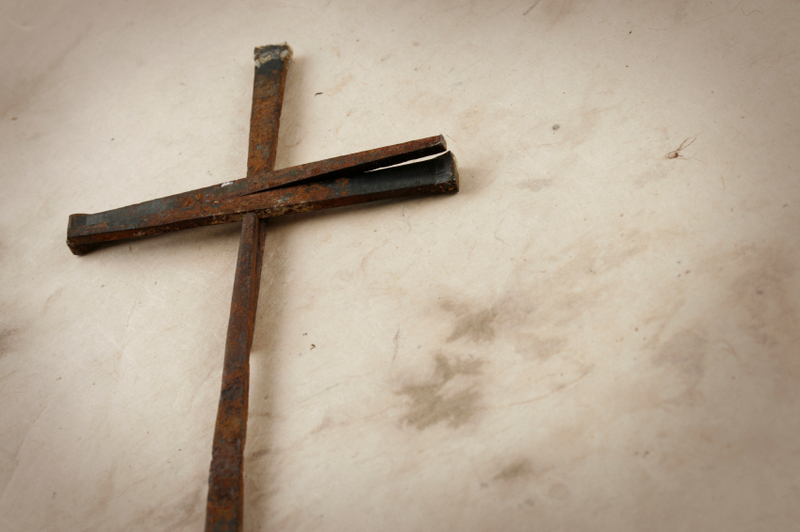 Click here to share the Gospel this Easter season using Billy Graham’s program, The Cross. Previous PostKendra’s Bible Study…Nehemiah 4:2Next PostHappy Resurrection Sunday! Thank you for the Easter message. I am printing it out so I will have it available to read often and pray that others get a chance to read the message. Thank you, Will, for this inspirational message. I too was deserted, by my husband of 57 years last fall. However, I know that my true husband is Jesus, who will never leave or forsake me. I keep you and the ministry at the beautiful Cove in my prayers. I was there to attend the Ladies Luncheon recently, and was so blessed. Thank you, Sandra. Glad to hear you were blessed at the luncheon. Thank you for your prayers. We lift you in prayer, as well. Blessings! Your Easter message was so inspiring and filled with the truth. I am 63 years old and at an age when I should have known better, I let sin into my life which destroyed it and without Jesus reaching down with his loving hands to pull me out of the deep, dark pit of depression and despair, I would not be filled with the inner peace and joy I have today. Yes, family, friends, enemies let me down, deserted me when I needed them most but Jesus gives us unconditional love and never, ever forsakes us. We are so glad the message was helpful to you, Ramelle. So thankful for Jesus and His love for all of us! May you be richly blessed and feel His love, comfort and protection always. In my life, I have been betrayed by many people who I thought were my friends. I felt hurt and lonely. I had often wondered if I would ever find someone who would accept me for who I was….I did! My husband, Dave and I celebrated our 28th wedding anniversary this past April 6th! Like me, Dave was betrayed by many of his “friends”. We have two sons. We were all baptized several years ago. The greatest joy a wife and mother could witness is the baptism of her husband and sons. I was the last one to be baptized! I thank the Lord every day for blessing me with my husband and sons! God Bless you Will, your father and grandfather! Thank you, Ellen! What a beautiful time of family baptism for your family. Congratulations on your 28th anniversary last month! Blessings to you. Thank you, Judy! Kendra and the kids are all well. We thank you for your prayers. Blessings to you! This Easter message uplifts me during this special time of year. I feel fortunate to have received this email from the Cove. My husband and I visited the Cove in August 2012. We prayed with a staff member for our son’s sobriety and safety. God has guided and comforted us through our family’s turmoil. We are thankful that God loved us so much that He gave His Son, so we can have eternal life in Heaven with them. Hello, Elizabeth. We lift your family in continued prayer. May God bless you mightily! Thank you, Ada. Please know that we will be praying for you, your husband and your son. God bless you! Praise God He is alive forevermore! Thank you for such a heartwarming message. Thank you for reminding us of the suffering JESUS went through to show HIS unconditional love for us.Blessings to your family and BGEA. Thank you, Ivy. God bless you! This is a wonderful re-telling of the Easter Story and Jesus’ love for a lost world. It helped me to understand the tremendous emotional pain our Savior suffered as He died on that cruel cross. My visit to the Cove a few years ago, and the inspiration I received, plus the feeling of being a member of the Billy Graham family, still resonates with me, and is something I will always treasure. Thank you, Will, for following in the footsteps of your beloved Grandfather, the Reverend Dr. Billy Graham! What a legacy of hope, evangelism, and love shared around the world because of what Jesus Christ did in the heart of that young preacher years ago! Blessings to you and the entire Graham family at Easter and always! May the Peace of God, and the Power of His Resurrection sustain each of you. With deep and heartfelt gratitude. A Forever Friend. Thank you, Georgia! We hope to see you back at The Cove. God bless you. Thank you, Will, I know the power of prayer and of Gods protection of our lives. When I was a little girl, my Paternal Grandmother was saved and when she visited us, she would spend hours talking to me about Jesus and the Bible. She lived to be 103 and prayed for all of the family by name every day. Recently, He restored a Dear friend from a massive heart attack. Yes, He answers and we must all pray for our Country now. Thank you, Shirley. What a legacy your grandmother left. Blessings to you! “HE DID IT ALL!! !” PRAISE THE NAME OF JESUS OUR LORD AND SOON COMING KING! Thank you for this perspective. May our Father continue to bless you & your family as ya’ll continue to serve Him. Thank you, Janice! God bless you! Thank you Will for your sad and yet beautiful desciptive picture of the whole “Easter” story. I have been to many, many conferences at the Cove and Montreat. The atmosphere is so inspiring; I almost feel at home there. Praise God for you, your father and grandfather. I am 82 years young and truly appreciate ALL that the Graham Family has done to share Christ with the whole world, through crusades, films, shoe boxes, disastger relief and many other actions. May God continue to bless your family, who in turn blesses us. Hello, Dorisanne! Thank you for your note. The Graham family appreciates your prayers and support over the years. God bless you!